We’re in trouble. It’s hard to defend your rights if you don’t know what they are. The annual survey from the Freedom Forum Institute found that 23 percent of Americans believe the First Amendment “goes too far” but 74 percent of Americans disagreed — yet 40 percent could not name even one right the First Amendment protects. freedom to petition the government. Start with a summary of each Amendment. You can add your visualization techniques to many of these. Freedom of religion can be represented by a cross, Bible, or church building, speech by a podium or megaphone, press by a newspaper or book, assembly by a crowd or a group of picketers holding signs, and petition by a scroll with names written on it. Link them visually one to another. Arms could be represented by a rifle or a revolver. Quartering soldiers could be remembered by visualizing three soldiers coming to a home and hoping to gain entrance by paying a quarter. You can finish the visualization with your own associations. Whatever works for you is best. Available at American Vision: $8.00. Great for children! 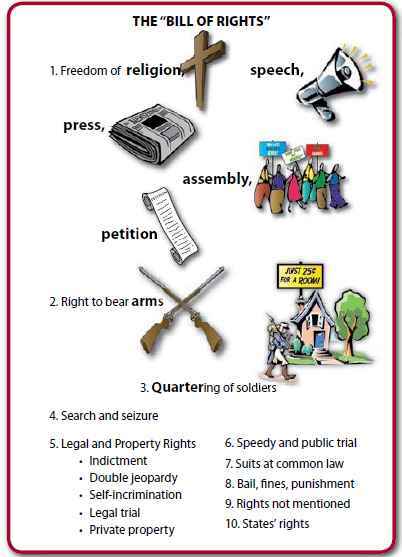 It’s not enough to know these particular rights. Knowing to whom they are addressed is equally important. For example, the First Amendment states, “Congress shall make no law regarding an establishment of Religion or prohibiting the free exercise thereof…” Religion is the first right protected with the other four following. It’s what Congress — our nation’s lawmaking body (not the Supreme Court) — can’t do. Also, note that nothing is said about the separation of Church and State. The Church/State language has been used as a cover for what the First Amendment was designed to do — to keep the Federal Government out of the business of the states. Praying in Congress, something our constitutional framers approved of by hiring chaplains was not considered an establishment of religion. Neither was mentioning God, as the Declaration makes clear and the Constitution recognizes. The real object of the First Amendment was not to countenance, much less to advance Mohammedanism [Islam], or Judaism, or infidelity, by prostrating Christianity, but to exclude all rivalry among Christian sects [denominations] and to prevent any national ecclesiastical establishment which would give to an hierarchy the exclusive patronage of the national government. opportunity peaceably to establish a Constitution of government for their safety and happiness. The proclamation acknowledges “the many signal favors of Almighty God, especially by affording them an opportunity peaceably to establish a Constitution of government for their safety and happiness.” This is seemingly odd language by a group of men who supposedly just separated religion from governments at all levels. In fact, the resolution uses devoutly religious language to acknowledge that they would not even have a government without God’s blessing. 'Murder Capital of USA' In Search of "Values"